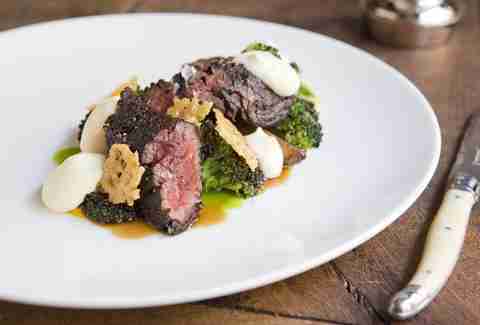 From a wood-fired steak platter to local cuts of beef, to a new spin on steak tartare, these local restaurants are serving steaks very well done. 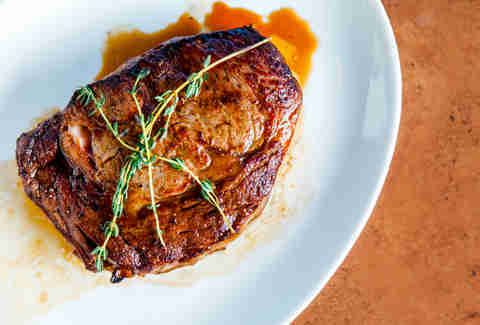 Whether you like yours Pittsburgh Rare (charred on the outside, red on the inside) or by another preparation, these are the nine best spots in the city limits -- excluding chain restaurants -- to sink your teeth into a steak. Perched on Mount Washington, swanky Altius is a place to treat yourself. The steak is a 32-day dry-aged 16oz bone-in ribeye. The prime cut of Midwest beef is grilled, and served with potatoes and veggies -- and the best view of the city’s skyline. A fresh take on the classic au poivre steak, Butcher & The Rye’s version is a hanger steak accented with with duck fat potatoes, burnt tip broccoli, roasted squash puree, béarnaise sauce, and rosemary. While you’re there, pair that steak with one of the bar’s 350+ bourbons. Cure is a carnivore’s paradise. Chef Justin Severino is a skilled whole animal butcher with a passion for cuisine that reflects Pennsylvania’s seasons and local farms. You can always count on the tender hanger steak -- and, of course, no trip to Cure is complete without the salumi board, a giant meaty mish-mash. 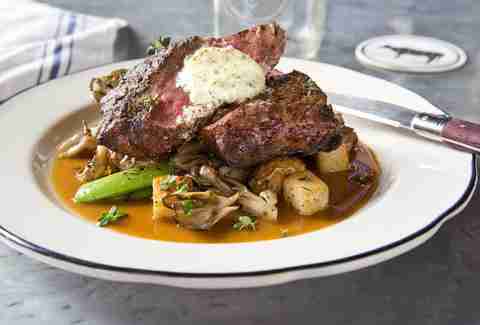 Renowned steak purveyor Allen Brothers provides the 22oz ribeye at Cioppino. Each hearty steak is hand-cut and aged. For dessert, step out of the dining room and into Cioppino’s backroom cigar bar to order a cigar, a nightcap, and some sweets. 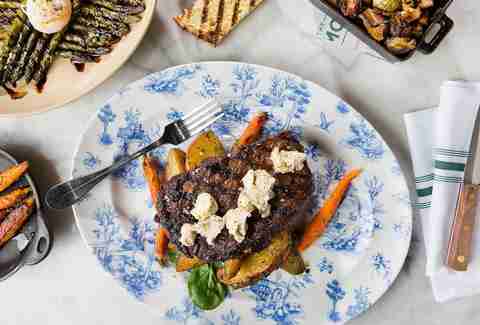 At The Commoner, inside Hotel Monaco, go for the classic ribeye, prepared decadently with foie gras and truffle butter, plus a red wine demi. Another crowd-pleaser is The Pittsburgh Rare, a twist on steak tartare: raw New York steak, charred onion aioli, grainy beer mustard, an egg yolk, smoked mushroom duxelle (basically an earthy paste), and topped with greens. Step one: Enlist the help of a hungry friend. Step two: Head to Gaucho Parrilla Argentina for the asado platter. Step three: devour it. The heaping plate of meat is complete with five cuts of steak, from flank to filet garnished with a chimichurri sauce. There will likely be a line out the door, but this wood-fired dish is entirely worth the wait. 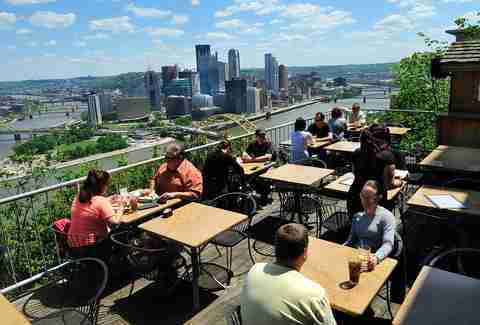 Named for its location on Mount Washington (formerly Coal Hill), this casual bistro is as well-known for its steaks as it is for its picturesque view. Neighbors to the Duquesne Incline, the restaurant’s deck is a great place to catch a summertime fireworks show -- over a steak dinner, obviously. Options abound -- choose among hearty cuts of flatiron, ribeye, porterhouse, strip, or filet mignon. Ultra-coveted Wagyu beef makes an appearance at Meat & Potatoes in the form of a flatiron steak with all the fixings on the side. 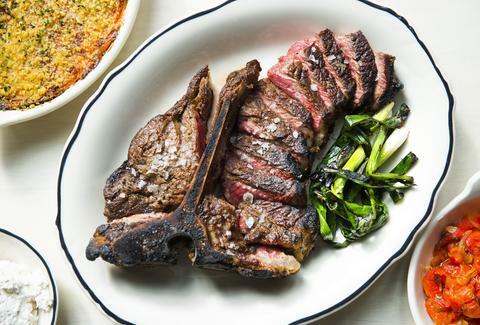 But that’s not the only meaty treat: the restaurant’s namesake dish -- Meat & Potatoes for Two -- is a show-stopper made for a pair hungry enough to devour a 34oz bone-in ribeye. Housed inside a former YMCA building with soaring ceilings and ornate architecture, Ace Hotel’s Whitfield dining room channels a luxe camp cafeteria vibe and delivers down-to-earth fine dining. Whitfield's beef is all grass-fed and sourced from Jubilee Hilltop Ranch in nearby Bedford County. All of the meat in the restaurant is butchered in-house -- and there are plenty of ways to try it, from the classic butcher’s steak to the family-style 38oz porterhouse. Rossilynne S. Culgan is a Pittsburgh native who is never patient enough to wait in lines... except at Gaucho when there’s the promise of an Asado Plate on the table. Follow her: @rossilynne.